Arizona State Parks Board appoints the seven-member, volunteer Off-Highway Advisory Group (OHVAG). OHVAG advises the State Parks Board and staff on the planning, development, funding, maintenance, and promotion on off-highway recreation in Arizona. OHVAG also advises on grants made with Federal Recreational Trails Program funds, and created the OHV Ambassadors, a peer program providing information and education at OHV recreation sites. 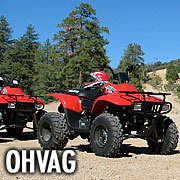 OHVAG members represent a variety of off-highway recreation interests and geographical regions within Arizona. Each individual is appointed to a three-year term. OHVAG members are expected to be active participants and commit time between quarterly meetings to help accomplish the goals of OHVAG. OHVAG members derive from a mix of motorized recreationalists, sportsmen, and the general public. The OHV Program is looking for candidates to join the team. Contact Matthew Eberhart at 602-542-2146 to discuss how you can become involved with OHVAG. The OHVAG serves in an advisory capacity to the Arizona State Parks Board. OHVAG is a body of dedicated citizen volunteers who assure public involvement in the implementation of the Arizona State Parks administered portion of the Arizona Off Highway Vehicle Program. The seven-member group is appointed by the State Parks Board. This advisory group is instrumental in the development and implementation of the OHV Recreation Plan. The mission of OHVAG is to develop and enhance statewide off-highway vehicle opportunities, and to develop educational programs that promote resource protection, social responsibility, and interagency cooperation. OHVAG Membership: seven members appointed by the Arizona State Parks Board to a maximum of two consecutive three-year terms. Five of the seven members must be affiliated with an OHV organization or group; one seat must represent casual OHV recreationists or the general public, and one seat must represent a sportsperson’s group (defined as a member of an organization representing hunting, fishing, or similar sportsperson outdoor activities). Members must be Arizona residents and no more than two OHVAG members may reside in the same county unless the recruitment efforts are unable to find new members to fulfill these criteria.